The dining-room has a large antique fireplace. The original mosaic floor is still intact and, together with the old chandelier, velvet curtains and antiques, gives this room a special character. 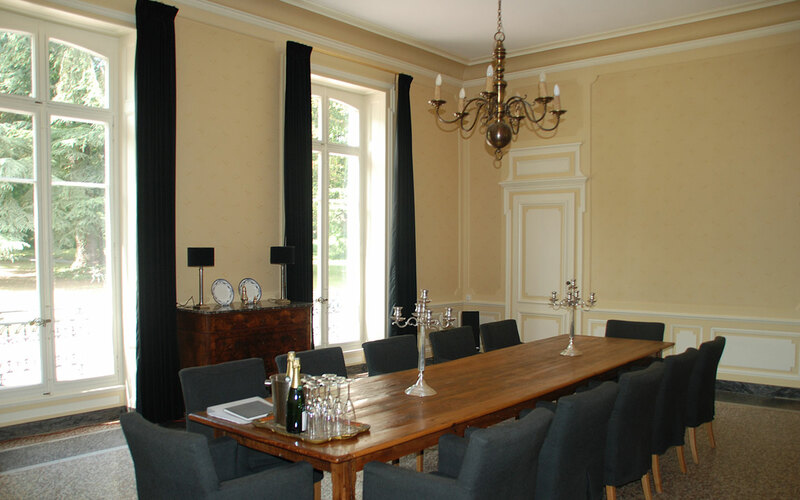 In the dining-room we placed an old French table of 4 meters (from a nunnery) with 12 comfortable arm chairs for perfect wining and dining! For the small princesses and princes we have a baby chair and a Tripp Trapp available. 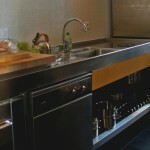 In our kitchen we combined antiques with modern and sturdy stainless steel. The SMEG kitchen is fully equipped and includes large stove, large oven, dishwasher, large cooler/freezer, Magimix food processor, an extensive set of first class, professional SIGG cookware and good knives. It even includes a Nespresso machine, so you can make your own superb espresso. Note that special Nespresso cups are needed. You need to bring these cups from home. But they can be bought in Lyon as well. 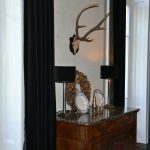 The huge antique cabinet has more than enough space for all cutlery, crockery, glassware and miscellaneous kitchen equipment. If you enjoy cooking, you can indulge yourself to your heart’s content. In the culinary heart of France, situated in the regions of Bourgogne, Auvergne and Lyonnais, Chateau Les Bardons is perfect for those looking to take advantage of the wonderful local produce but we are also happy to help organize a catering if you prefer.